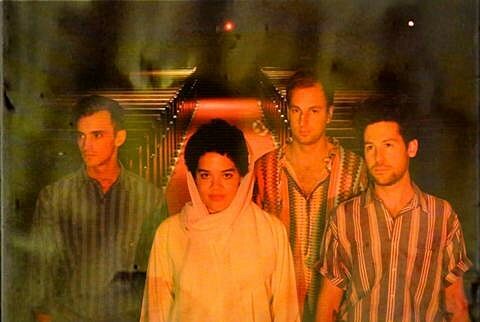 Toronto’s Weaves are a pretty new band — they formed this year — though singer Jasmyn Burke fronted Rattail who toured a lot with bands like Makeout Videotape (Mac Demarco), Phedre, and Hooded Fang. This new venture is with Morgan Waters (who was a child actor on the CBC) and have released two singles so far — “Motorcycle” earlier this year and “Take A Dip,” the video of which we’re premiering in this post. The song crashes into existence with a big rock riff, but then settles into a groove were Burke’s vocals take command. As for the video, there seems to be some sort of religious sacrament going on, I’ll leave it to you to interpret. Weaves will be in NYC next week for CMJ. They’re playing the Force Field showcase at Baby’s All Right on Tuesday (10/15) with Joanna Gruesome, The History of Apple Pie, Free Time, Body Parts and Celestial Shore; and they’ll also play Santos Party House on next Friday (10/18) with fellow Torontonians Odonis Odonis and HSY, plus Saul Williams w/ Dragons of Zynth, Rey Pila and Victory (tickets).